In the news and in studies, we often hear a lot about sea level rise, mainly in the form of estimated numbers of future sea level rise and other predictions of how it will affect coastal communities, like in Louisiana. To cut through some of this noise, we thought it would be helpful to break down the basics of sea level rise and discuss what this means specifically here in Louisiana. In this first part, Alisha Renfro explains historical sea level rise that has occurred over time and in the second, she will look at future predictions. 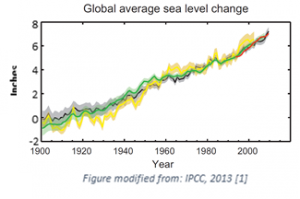 Around the world sea levels are rising, but how much sea level has changed at a specific location, called relative sea level rise, can vary, depending on local environmental processes and human activity. On a global scale, sea level has increased by more than seven inches over the last 109 years at an average rate of 0.07 inches per year. While this vertical change in sea level may seem quite small, it can have a big impact on low-lying coastal areas found throughout the world. In Louisiana, the change in sea level that has been documented is much more dramatic, because as the sea rises the land beneath our feet is also sinking. How much local sea level has changed with time varies from location to location. However, the highest rate of sea level rise observed in the contiguous U.S. is in Louisiana. At Grand Isle, measurements indicate that a two foot rise has occurred over the last 70 years. At an average rate of rise of more than 0.3 inches per year, the sea level change at Grand Isle is four times higher than the global average. [1,2] This high rate of local sea level rise is a result of land sinking, also referred to as subsidence. Along Louisiana’s coast, the rate of subsidence varies in response to a combination of natural processes (i.e. tectonics, sediment compaction, sediment loading, and glacial isostatic adjustment) and human activities (i.e. subsurface fluid withdrawal and changes in the drainage and management of surface water). Sea Level Rise + Subsidence. Credit: NOLA.com. Rising sea levels can cause barrier islands to be eroded and disappear, wetlands to erode and drown and salty waters from the Gulf of Mexico to push farther and farther inland, upsetting the fresh and salt water balance of estuaries and harming the wildlife and vegetation that depend on them. However, coastal wetlands can adapt to rising sea levels, at least to some extent. Deposition of sediment on the wetland surface, growth of plants, and accumulation of plant debris can increase the elevation of marshes, helping them keep their head above water in the face of rising seas. Unfortunately, Louisiana wetlands are currently at a disadvantage. Levees along the Mississippi River severely limit the flow of sediment the wetlands need to keep to pace with ongoing high relative sea level rise rates, leading to wetland loss. The rate of global sea level rise is increasing and the survival of much of Louisiana’s wetlands depend on the sediment carried by the Mississippi River. In the next post, we’ll look at future sea level rise estimates and discuss their implications here in Louisiana. Reed D.J. and B. Yuill, 2009, Understanding Subsidence in Coastal Louisiana. A report targeted at resource managers that summarizes subsidence and the issues related to subsidence in coastal Louisiana. 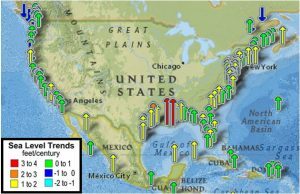 Shinkle, K. D. & R. Dokka, 2004, Rates of vertical displacement at benchmarks in the lower Mississippi Valley and the northern Gulf Coast: NOAA technical Report, NOS/NGS 50. Bernier, J. C., 2013, Trends and Causes of Historical Wetland Loss in Coastal Louisiana (Vol. 2004). USGS Fact Sheet 2013-3017, 4 pages. Couvillion, B.R. ; Barras, J.A. ; Steyer, G.D.; Sleavin, William; Fischer, Michelle; Beck, Holly; Trahan, Nadine; Griffin, Brad; and Heckman, David, 2011, Land area change in coastal Louisiana from 1932 to 2010: U.S. Geological Survey Scientific Investigations Map 3164, scale 1:265,000, 12 p. pamphlet. Kirwan, M.L., S. Temmerman, E.E. Skeehan, G.R. Guntenspergen and S. Fagherazzi, 2016, Overestimation of marsh vulnerability to sea level rise. Nature Climate Change 6, 253-260.